Over 1,500 scaled Agile professionals plan to attend, almost quadrupling the attendance of similar conferences like Business Agility 2018 in New York City. There is the possibility of earning up to 41 Professional Development Units (PDUs) over the course of just six days. Remember: you only need to earn 35 educational PDUs over a three-year time period to sustain most Project Management Institute certifications. Don’t you love it when conferences are actually practical to attend? Incredibly, these figures only represent the surface of what you can get out of the Agile SAFe Summit. Below, we outline some tips you can follow to make this Agile SAFe Summit the best summit you’ve ever been to. I frequently get overwhelmed just looking at conference agendas. There are so many sessions to attend, so many people to meet, and so many things to learn. Not to mention all the travel and accommodations that need to be arranged and bringing a big enough suitcase to take home all of the swag you’ll walk away with. You’re going to a project management conference, so I think it goes without saying that you’ll want to have a strategic plan of attack in order to meet your Agile SAFe Summit goals. Maybe you can even nerd out about your carefully crafted agenda with some other cool PM’s! Having a solid idea of what you’re getting into is the first step to getting the most out of Agile SAFe Summit. That’s a lot of sessions, and lot of tracks to choose from. How do you narrow them down? Trust in the process and pick a track. This is probably your lowest stress option and, depending on your role and industry, nearly guarantees that you’re attending sessions that will be useful and relevant to you. Go through the agenda time slot by time slot. This can be tedious, but by looking at every available session happening at a given time, you’ll get a better idea of all your options. During any given time slot, pick the session that most speaks to you and seems like it would be the most useful to your specific needs or interests. Coordinate with your colleagues. If you’re heading to SAFe with a team, plan to attend different sessions during the same time slots so you can all compare notes at the end. That way, it’s almost like you attended every session at the conference. Of course, you shouldn’t force colleagues to attend sessions that aren’t useful to them or to your company. But if several sessions in the same time slot sound appealing, try to have someone from your team sitting in on each of them. Plan by speaker. If you know that you really admire someone leading a session, hop into it. You can learn a lot by listening to someone you already know is an expert. Plus, you might get to chat with them in person at the end of the sessions! Nothing like meeting your SAFe idols, am I right? You can also check out some of the SAFe Summit sessions our team has already highlighted as worth attending. Maybe we’ll see you there! Let’s start with a very literal idea of mapping by focusing on where this Agile SAFe Summit takes place: in our nation’s capital. D.C. is accessible from three major airports, so pay attention to where you booked your flight. The Gaylord National Hotel and Convention Center, where SAFe Summit is happening, is about a 15-minute taxi ride from Ronald Reagan National Airport, a 40-minute drive from Dulles, and 50 minutes from the Baltimore airport, BWI. Consider these travel times when registering for sessions—and add at least 30 minutes to each route if you’re traveling during rush hour. DC traffic is no joke. The convention center is also a 15-minute drive from Old Town Alexandria and the National Mall if you’re planning on building some sightseeing into your business trip. Mapping out your time realistically to create a solid plan of action can go a long way in ensuring you meet all the people you want to meet and see all the things you want to see. Alright, you’ve landed in DC! You’ve dropped your luggage off at your hotel, and you’re ready to get into the nitty-gritty of SAFe best practices. The opening remarks are one of the few times at Agile SAFe Summit where there aren’t conflicting sessions or workshops. Everyone else will be there, so you might as well go, too. Opening remarks also set the tone for the rest of the conference, helping you get a better understanding of SAFe’s place in the enterprise. In fact, that’s the topic of Chris James’s talk during the opening remarks. It’s also one of the few chances you’ll have to be in the same room as all of SAFe Summit’s attendees. So if you’re looking for something to say while you’re networking, you can always fall back on an opener like, “Hey, what did you think of [that thing Chris James said] in the opening speech?” Start your networking planning early with the very first talk of the conference. Trust me, your memory isn’t going to cut it here. You’ll need some great notes to keep track of all the helpful things you’ll learn at the Agile SAFe Summit. My suggestion here is simple: go analog. You can get a nice notebook and pen just for your Agile SAFe Summit thoughts so you can jot them down whenever anyone says anything interesting. That way, you won’t have to rely on your internet connection or sitting next to an outlet in order to charge your laptop. You should take notes in whatever way works best for you, but I do have one note-taking tip to help you keep everything from the Agile SAFe Summit in your mind: write down three to five takeaways at the end of each session you attend. You can also take notes after each networking meeting so you don’t forget important details about the new connections you’ve made. This method also makes your notes skimmable and will help you share the important points from each session with your colleagues if you’re coordinating session attendance. Don’t just keep your head down and scribble your notes furiously during your sessions at the Agile SAFe Summit. During your sessions and workshops, be sure to ask questions. After the sessions, chat with the people sitting around you to get their thoughts on what was said. You can even go as far as organizing discussion groups after your sessions, whether it’s with your colleagues or with fellow attendees. All that running around can wear you down, but you’ll want to stay alert during the entirety of the Agile SAFe Summit. 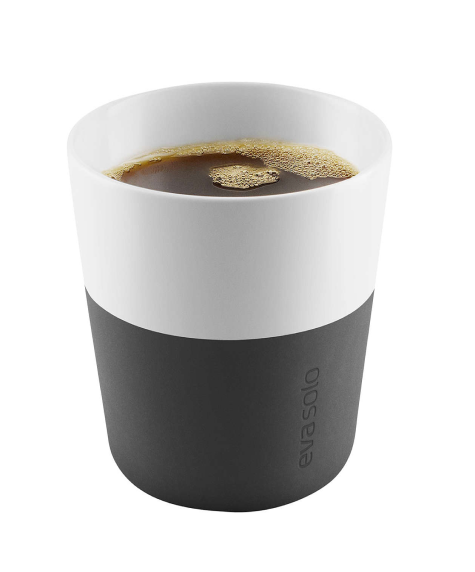 I’m a caffeine addict, so my go-to suggestion for staying charged is to know where the nearest coffee station is at all times. But the Agile SAFe Summit is a jam-packed three-day event—five days if you’re attending the pre- and post-sessions—so chugging coffee might not carry you through for the whole shebang. Especially if you’re an introvert like me, several straight days of meeting new people and running from here to there can be really draining. Although you should make time to network and chat with everyone else gathered at the Agile SAFe Summit, you should also be sure to make time for yourself. Even if it’s just five minutes, carve out some time where you can take a few deep breaths and forget about the conference for a minute. Take a sip of your coffee before it gets cold, grab a snack to refuel, or try out a quick but relaxing meditation session in your hotel room. To stay on top of your networking and professional development game, you need to take care of yourself first. You know what they say about conferences: tweet or it didn’t happen. Quote session leaders and speakers when they say something interesting. Tag them in your tweets, and use the Agile SAFe Summit event hashtag to group your tweets and tie them back to the event. Take pictures of people you meet and share them on Instagram. Use the event hashtag there, too. Share your insights and good times to promote both yourself and your company during the Agile SAFe Summit, as well as participate in the conference on a public forum. Remember you can’t rely solely on social media to convey your message, largely because nothing can replace an in-person meeting. A whopping 40% of prospective customers convert after an in-person meeting—compare that figure to just 16% of any other kind of interaction. According to research presented in Organizational Behaviour in a Global Context, “Face-to-face interaction is the most effective form of verbal communication when the sender wants to persuade or motivate the receiver.” In other words, in-person appeals close the big deals. 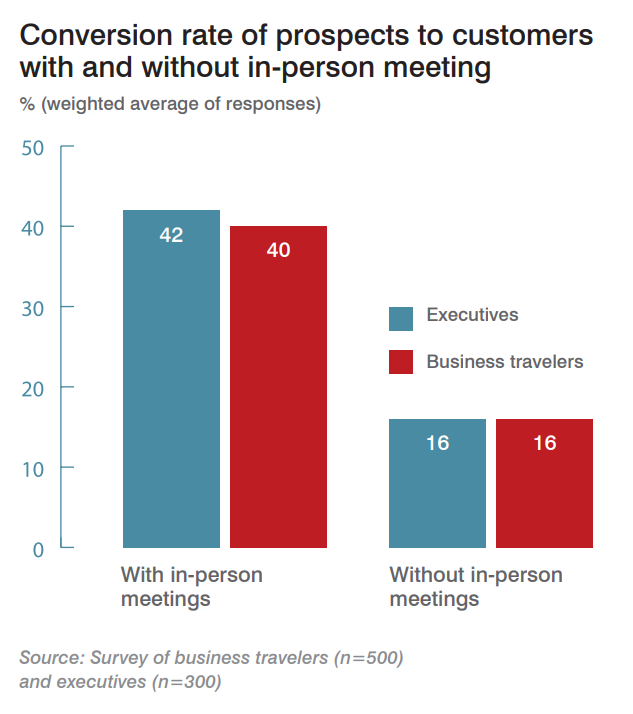 Oxford Economics found that in-person meetings are almost entirely (85%) “more effective” than meetings online. 95% of people say that long-term business relationships must have a face-to-face basis. In other words, you probably included networking in your business case to attend this conference. And the research shows that doubling down on your networking efforts will be worth your while. But when you’re surrounded by industry experts, striking up a conversation can be intimidating. How do you combat those feelings of imposter syndrome? There was no entrance exam to get into SAFe Summit; there isn’t a “minimum knowledge requirement” to attend. You’re likely surrounded by people who feel just as insecure; one study found that 70% of people—men and women alike—suffer from impostor syndrome at least once in their life. In my experience, the Agile community is all about helping people grow and iterate. The people who will be at Agile SAFe Summit are kind. Trust me. Bottom line: network for your bottom line and also to learn a thing or two from the industry experts around you. If you’re heading to the Agile SAFe Summit with a team, help take charge. Coordinate discussion groups or plan dinners or coffees with people you meet at the conference. Gather a group that will meet at the breakfast sessions and talk about game plans for the day. Even something as small as creating a shared Google Doc or Slack thread where everyone can add notes or relay important information to the group is an act of leadership. Help your team get the most out of the Agile SAFe Summit so you can, too. I walked away from the last conference I went to with a swag bag bulging with branded pens, some Post-its, a Slinky, a coffee cup, and even a box of light bulbs. You, too, can walk away from the Agile SAFe Summit with such a plentiful bounty! Before prioritizing swag, prioritize the people and companies you want to network with. But after… go for the good stuff. Scope out the booths offering cool t-shirts, reusable water bottles, and portable phone chargers. Enter raffles for bigger prizes so you can impress all your friends. And, of course, swing by the Targetprocess booth to hang out with the coolest people at Agile SAFe Summit and pick up a sweet, sweet tumbler. If you’re looking to add a fun layer to this, you can even create a contest with your team: see who can walk out with the most swag and agree to crown them the winner of the Agile SAFe Summit. Long live the winner! The sessions are over, and the booths are all packed up. But you’re not done with the Agile SAFe Summit yet. To really get the most out this conference, recognize that it’s not over when the convention hall closes. Even if it’s just to send a quick email thanking them for their time, cement those professional connections you spent so much time building at the Agile SAFe Summit. Following up immediately after the conference will ensure that people still remember your face, your company, and why you’re reaching out. Plus, it shows that you remember them out of the sea of people you were networking with. If you’re not sure what to say, you can check out this slew of follow-up email templates specifically for conference attendees. Reflect on how successful the Agile SAFe Summit was for your company by regrouping with your team to ask what their thoughts were. Take this time to compare your team members’ notes from different sessions. Ask everyone to give a brief presentation about the most useful things they learned at the summit. Most importantly, ask your team if they thought the conference was helpful. If you’re planning on attending the conference next year, go ahead and create a game plan. What would you do differently? What would you do again? After all, it’s never too early to start thinking about the future. Good luck out there at the Agile SAFe Summit! May you learn a lot and meet many new and interesting industry professionals. SAFe travels, and see you in October!